OSHA has released its amendments to its recordkeeping regulations and both the wording and the format of the new records are being questioned. An alert published by Morgan, Lewis & Bockius LLP on JD Supra Business Advisor discusses the problems OSHA's new electronic reporting regulations may bring and offers some advice. The revised regulations include two sections that will directly impact almost all contractors. 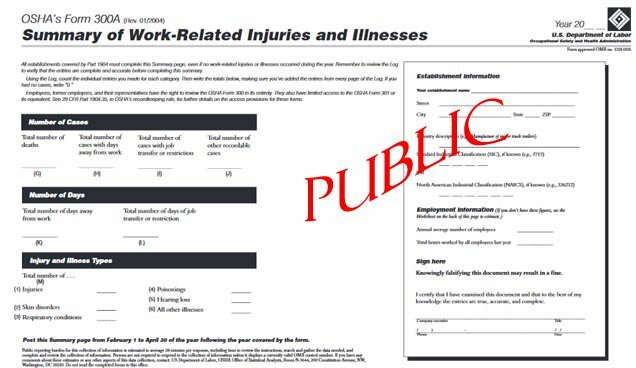 The first amended regulation is as of January 1, 2017, employers must submit an digital annual report detailing their company's injury and illness data directly to OSHA, who will then make that data public. The second amended regulation is part of the existing whistleblower protection already in place. Currently, employers must ensure that their procedures for reporting work-related injuries and illnesses are reasonable and do not deter or discourage employees from reporting. Employers must also inform workers that they have a right to report work related injuries and illness free from retaliation. If a worker does feel employer retaliation has occurred, reporting that event is now a separate category in the OSHA reports. Before, employers could only be cited by OSHA for not having a workplace illness/injury procedure in place. Now OSHA can cite an employer if the company's procedure is not 'reasonable' or discourages employees from reporting. The public availability of the employer's and employee's data also raises security concerns. OSHA says it will use software to remove private employee information, but if anything has been learned about computer data security it is that software programs are not infallible. If sensitive data is somewhere in the system, it will be somehow available. Employer information in the new electronic reports is also open to subjective interpretation by competitors, media, or other interested parties. The current business and media environment already plays fast and loose with easily accessed data. Read 'OSHA Electronic Recordkeeping Rule Creates Significant Reporting Requirements, Potential Enforcement Risks' here.